March was a good month for me! It's my birthday month, and I happened to win a $250 giftcard at work... but I decided not to credit my clothing budget. I'm proud of myself for not going hog wild on a spending spree, even resisting a Tory Burch sale. My, how I've grown up. Fabletics Outfit (originally $50, FREE): Camacan Capris (and a credit for a returned top), earned at no cost for referral, review, and purchase points. Check out my review of the outfit here. It's my third month doing Fabletics, and I LOVE it! I still don't feel like I have all the pieces I need in my workout drawer, so it's helping me on that front for sure. Super pumped this month was a freebie, as my remaining budget was pretty tight. J. Crew Factory Classic Button-Down Shirt Gingham (originally $55, paid $38): This was straight off the wishlist, as I love so many of the gingham layering looks I see on blogs. I chose the dark navy check as it seemed the most classic. The J. Crew pieces I bought were already on sale, then I used a 30% off code to stack deals. J. Crew Factory Clare Cardigan in White (originally $55, paid $28): These are my #1 favorite cardigans, and I noticed that I need a white one in my closet as the weather warms up. I keep reaching for one that doesn't exist, so I know it will get some wear this spring/summer! J. Crew Factory Croc-Embossed Belt in Dusty Charcoal (originally $30, paid $7): This was an add-on to my J. Crew order, since it made shipping free but was basically the cost of shipping. I wear a lot of skinny belts with my cardigan outfits. Dorothy Perkins Blue Floral 2-in-1 Dress (originally $29, paid $23): I already have two dresses from Dorothy Perkins, and I love them both! I spotted free shipping and 20% off codes online recently, so I decided to try the site out again with a couple of fit-n-flare dresses. I am determined that the weather will turn around and it will be spring dress season again! This dress was an instant favorite for me. The material of both my DP dresses was soft and stretchy, way better than other dresses I've been browsing that cost more. Dorothy Perkins Navy & Ivory Striped Boxpleat Dress (originally $29, paid $23): I wanted to LOVE this dress, but the torso length felt slightly off on me. Returns to the UK were too pricey, so I did my best to make it work... and I grew to love it. Dorothy Perkins Bird Ditsy Necklace (originally $9, paid $7): Free shipping add-on piece, because I need more gold! Not amazing, but I am sure I will wear it occasionally. J. Crew French Print Popover (originally $88, paid $51 with shipping/tax): I blame two people for this... Caroline for telling me I had to have this French-themed shirt (I was a French major after all), and Fran for mentioning the 40% off sale prices offer on her blog! I also credit the same two people for bringing this wonderful top into my life. Merci. The deal took the price down to about $41, but I had to pay shipping and tax. I think I'm moving down a size in J. Crew based on this shirt (woohoo, weight loss!) but keeping this one as-is. Long-Sleeved Dress from Macy's (FREE): Birthday gift from my Mom, has a great silhouette and I've already worn it! Overall, I'm pleased with myself in terms of how my first quarter went. I was a bit over budget, but given how much money I saved I don't feel like it was a terrible offense. Budgeting almost a year now with Fran has helped me realize that I was shopping emotionally a lot of the time. I'm more deliberate about what I buy now, and I cull my closet more often. (To my local Goodwill's delight!) I'm scared to think how much I was spending on clothes before, knowing that it was perfectly normal for me to go into a Forever 21 and spend over $100 on a regular basis, on clothes I didn't even keep for a year. 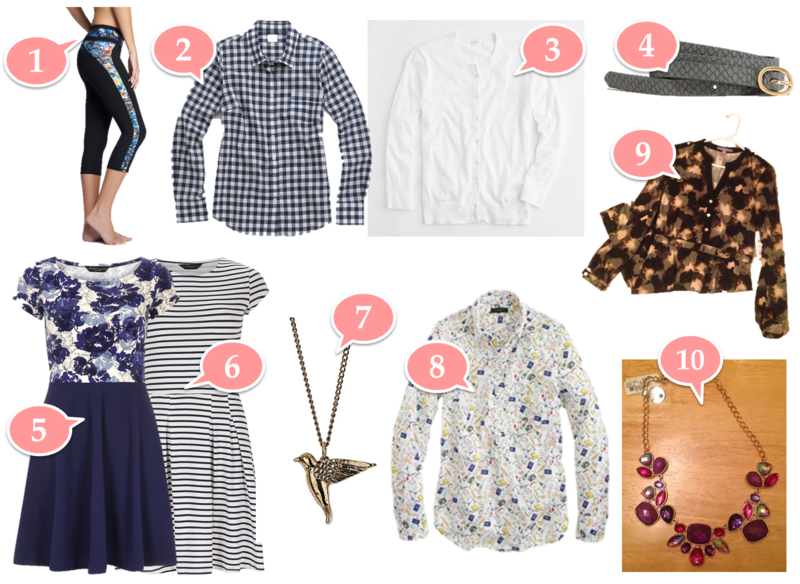 Don't forget to check out what the rest of Fran's Budgeting Bloggers hauled this month! You got some great things this month, it rally like the dresses! That's one of the reasons I joined in too. I'm definitely an emotional shopper, and not at Forever 21. lol but not. YAY for sizing down and meeting fitness goals! I love those two dorothy perkins dresses! Their stuff is adorable. I liked-unlined-then liked again that IG photo. Perfection. Also, mad jelly you have that gingham button down. It's backordered until JUNE. Thank you!!! :) How could I resist? Thanks! I love that the dresses are mostly cotton and of a thick material that feels great against the skin. Backordered?! Crazy. It feels a little big but after some washes it should work well. I also may take it in a little, as I find that the bust is too big in the J. Crew buttondowns for me... I need a large size but a small bust. Ack! Girl - that dress looks AMAZING on you! I mean I'm slightly partial, because I love me a good stripe, but seriously, gorgeous! And what a great necklace as a gift! Too cute! That is impressive! Kudos to you! $127 for all that, it's great, even at $177. I really admire that J.Crew Factory gingham shirt - I tried to force myself to like it but then I let reality sink in, I shouldn't pay for a brand if it is poor fit regardless of the price. But sometimes it is so hard, you know? I'm glad it worked out for you! I found one by BR and I am keeping my fingers cross it's going to work out. I completely under the shopping emotionally thing. I do that quite often, and it can get me in quite a bit of trouble (I spend too much and end up with things I don't need...plus the guilt and regret). Doing the budgeting bloggers linkup helps me quite a bit. I have to say that #9 dress is my favorite...it looks so lovely. I did pretty well this month too and didn't blow my budget like I did last month. Happy belated b-day by the way! Those Dorothy Perkins dresses are so cute - and it's nice to hear that they're also mostly cotton! I'm always on the hunt for a good cotton dress - I find polyester hard to wear most of the time in my warm climate. I really love the material, and I wouldn't hesitate to buy more. The only issue with DP is that return shipping to the UK is expensive, so only buy items that you truly love and get a good deal on, you know? Sometimes with US stores I'll order multiple sizes or extra items just to try on, then return for free. Not so easy with DP! You did so well! Seriously, you really got a lot for you money! I have never purchased anything from Dorothy Perkins... do you feel like the quality is decent? And are the dresses a good length? I am tall so I always have to ask about dress length :) They have cute items, I would love to order something from them! I do feel the quality of the Dorothy Perkins items I've purchased is decent, especially for the price. These dresses I bought are stretchy cotton; I would compare the quality to H&M. I'm picky about dress length, because I like dresses that I can wear to work. So many of the dresses are super mini these days, which must be even worse for tall girls! I love Dorothy Perkins dresses! The ones you got are so cute! I really love the floral print. I've been keeping track of my budget for 3 months now, and I've definitely learned a lot about my shopping habits. I think the worst realization is that I'd rather spend money on fun weekend clothing than on things I can wear to work. I need to shift my budget a little towards the pieces I'll get more wear out of. I'd rather spend my money on FOOD is what I'm finding! :) Honestly I think the savings I've gotten from budgeting has gone mostly towards some fabulous restaurant experiences with my man. But I do have the benefit of working at a casual office, so even a good pair of skinny jeans works for both my job and weekend fun. I benefit from more crossover. omg i need those dorothy perkins dresses. love them! I worry about ordering from Dorothy Perkins because of the returns situation, but their stuff is so cute! Glad to hear that both dresses are going to work for you! Thanks! I'm wearing one today.